Caption slip reads: "Photographer: Mack. Date: 1959-01-07. Reporter: Hertel. Assignment: Costa Rican Teachers.#2: Group of 15 Costa Rican teachers shown on arrival here at Greyhound Bus Depot. L to R -- Miss Lois Smith, Westwood Community chairman, (with black hat) greets Raul Zamora, and shakes hands with Julian Zamora, (with breifcase), who is leader of visiting teachers. 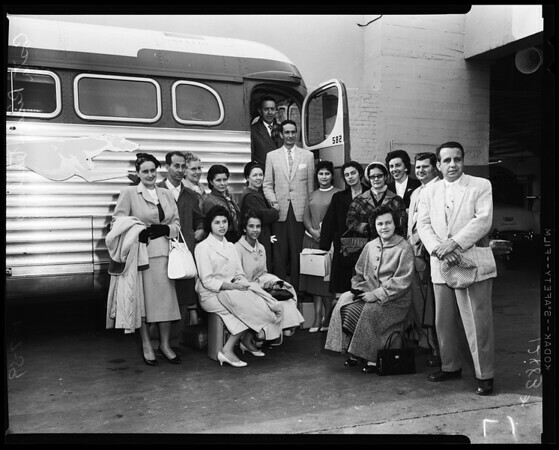 #1: Same as above with Julian Zamora in doorway of bus being greeted by Miss Lois Smith."